With all of our paperwork in hand, we said goodbye to Anacortes and headed up to Blaine for our border crossing. First stop was U.S. Fish and Wildlife where Nate and Primo’s passports were stamped out of the country. After paying $350 for the two birds’ privilege to leave the U.S., we head to Canadian Customs. The customs agent takes all of our paperwork and disappears. A few minutes later he is handing us everything back and said we are good to go. WHEW! That was easy. They didn’t even look in the RV or inspect the birds. Maybe the U. S. Should take some lessons from Canada. 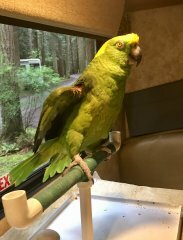 One Customs officer in Canada can handle all the paperwork where in the US three different government agencies are needed to process the paperwork of a pet bird. At some point we will have to figure out how to get the birds back into the U. S. We will worry about that his fall. For now, we are just happy to have this part behind us. 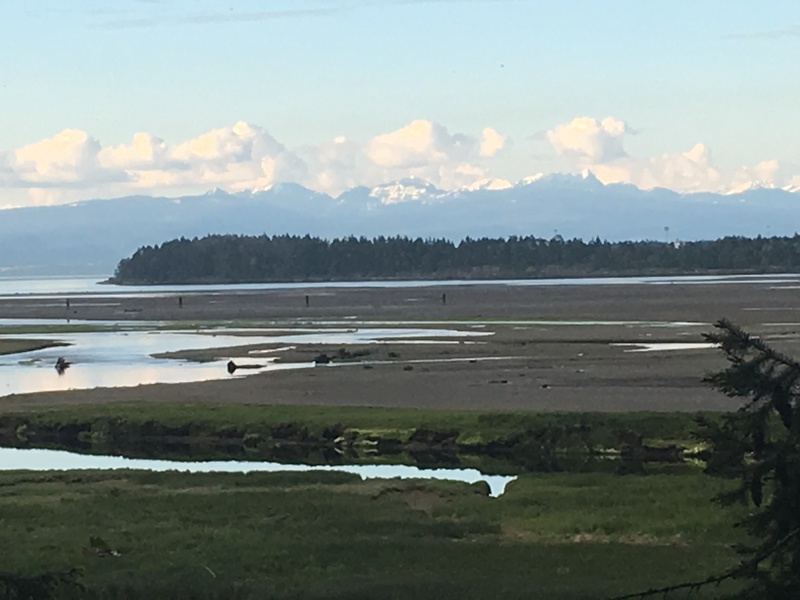 Once across the border, we continue north to Tsawwassen ( don’t ask me how to pronounce that one) just outside Vancouver City, where we catch the B.C. Ferry to Nanaimo which is on Vancouver Island. It’s about a two hour crossing. 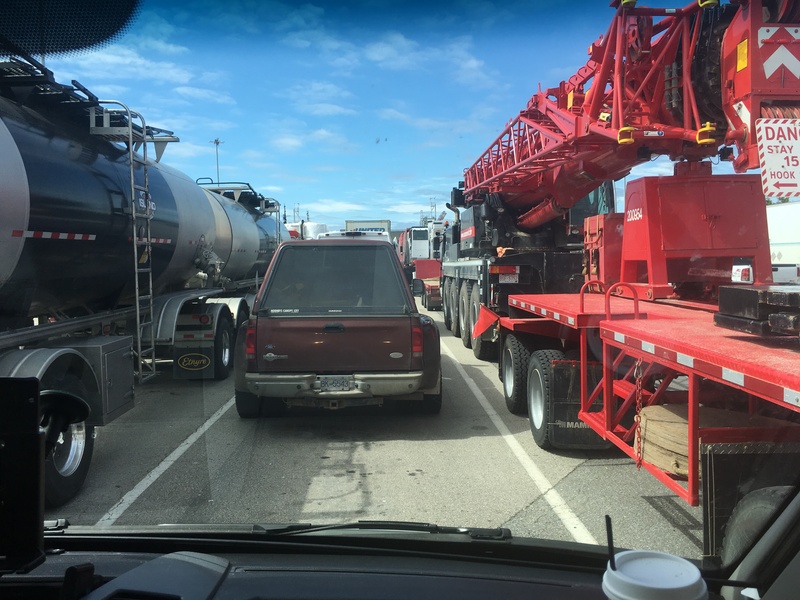 We take our place in line behind all sorts of commercial vehicles. Somehow they manage to fit us all onto the huge ferry. There must be several hundred cars and trucks filling two lower decks. Once loaded on the ferry, we explore the three upper decks. This part of the ferry looks more like a cruise ship with lounges and restaurants. The Living Pines RV Park is our home for the next few days. We have a beautiful spot overlooking the Nanaimo River. 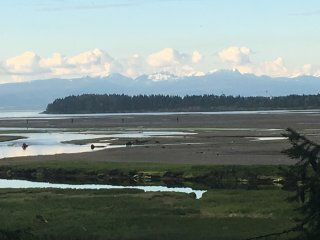 The 10 foot tides produce acres and acres of mud flats with each low tide. 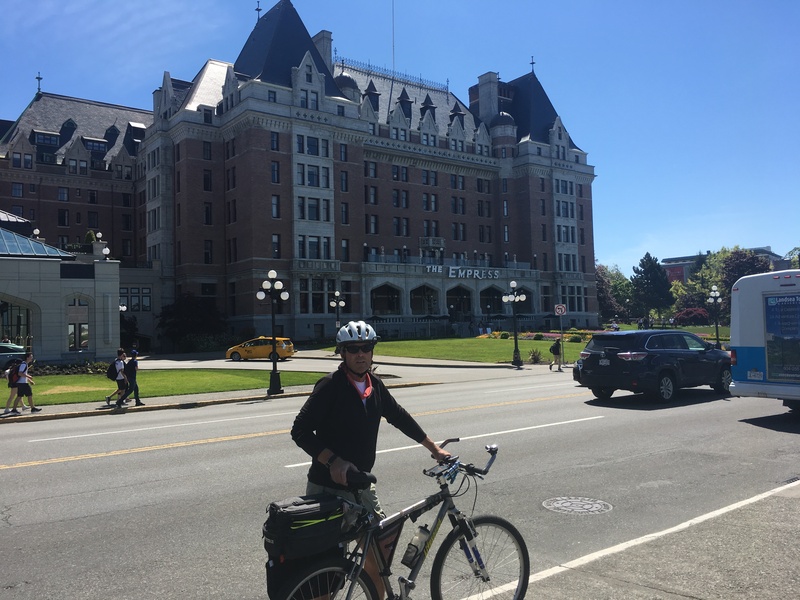 We spend the next day bicycling the E & N Bike path around Nanaimo. The harbor is busy with commercial fishing boats and float planes coming and going. The town is excited about the cruise ship being in the harbor. Only five cruise ships visit Nanaimo each year, most stop in Victoria. Nanaimo is more of a blue collar working town than tourist stop. 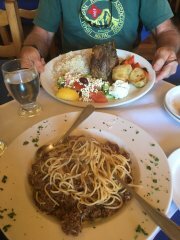 We did find a fantastic Greek restaurant for lunch. Several locals had recommended we eat here and their recommendation was spot on. 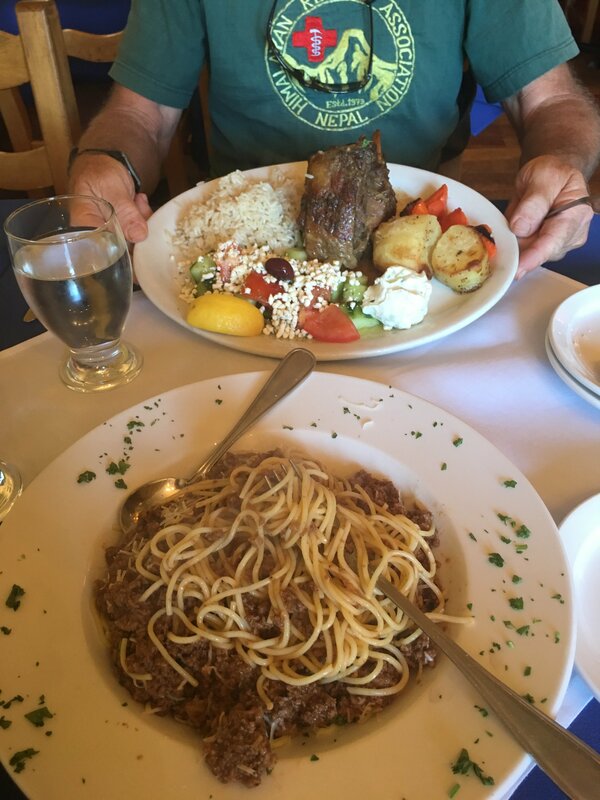 The lamb dishes were phenomenal. 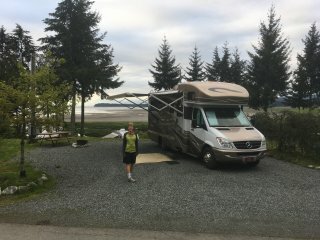 After two days in Nanaimo, we moved the RV to a park just outside Victoria in anticipation of the ships arrival. The Galloping Goose bike trail passes right through the RV Park. We enjoy the great biking opportunity with rides each day of about 30 miles. 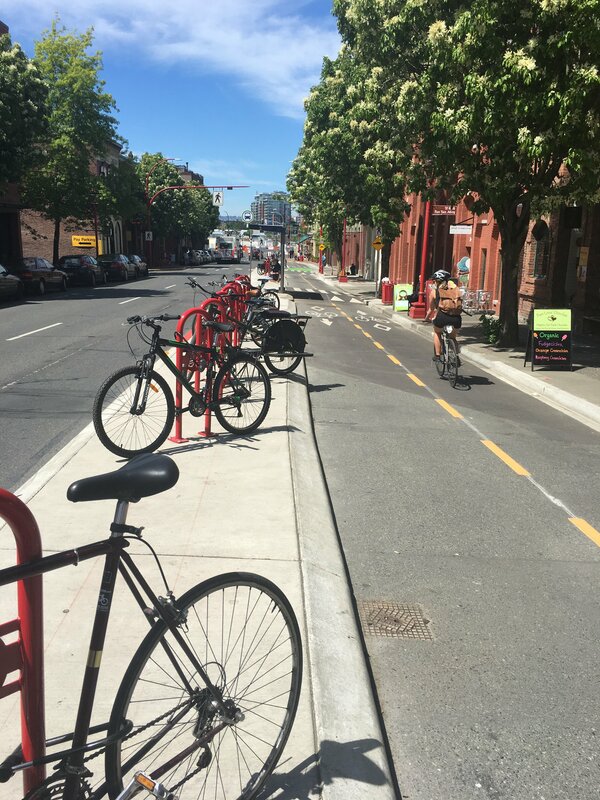 Vancouver Island has a vast network of bike trails . These trails get much use from both residents and tourists and remind us of those in Europe. Here bicyclists come first and cars give way to the cyclists at any road crossings. 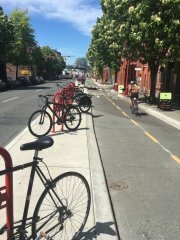 There are even bike lanes in the heart of busy downtown Victoria. Motorists are very courteous to the cyclists. 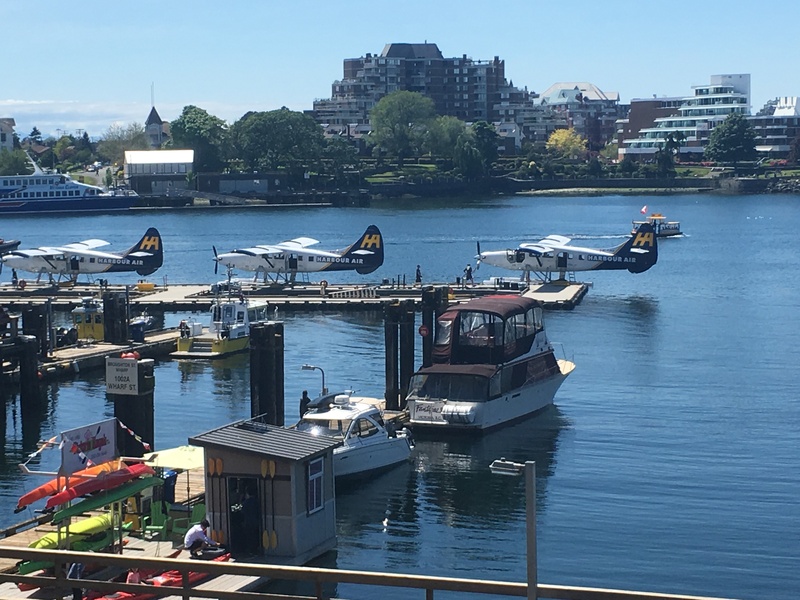 The Victoria waterfront is the hub of city activity with all sorts of comings and goings via private boat, taxi boats, fast ferries and even seaplanes. There are more takeoff and landings of seaplanes here than anywhere else in the world. We study the harbor with great care. In a few days we will be offloaded from the ship and will have to navigate through this maze of traffic. There are designated lanes for small craft, large craft, and sea planes. We certainly don’t want to get in the wrong traffic pattern. So… we are now in an RV Park just outside Sidney, B.C. waiting on the Clipper Nassau to arrive. So far everything has gone as planned and everything is still on schedule. We did hear from another boater who’s boat was offloaded in Ensenada. Their offloading went well and they were pleased with the condition of their boat when it arrived. We check the AIS this morning as we have done many times over the last few weeks. 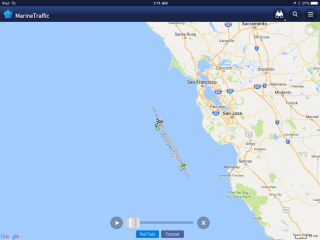 The Clipper is off San Francisco and appears to now be heading south! What…that is the wrong way. The weather forecast for that area is calling for gale warnings with up to 15 ft. seas over the next 24 hours. Yikes! We didn’t see this coming. We soon have an email from Sevenstar stating “ 25 knot winds…waiting on a berthing assignment”. For the next 16 hours the ship circles never going more than 10 miles in any direction. 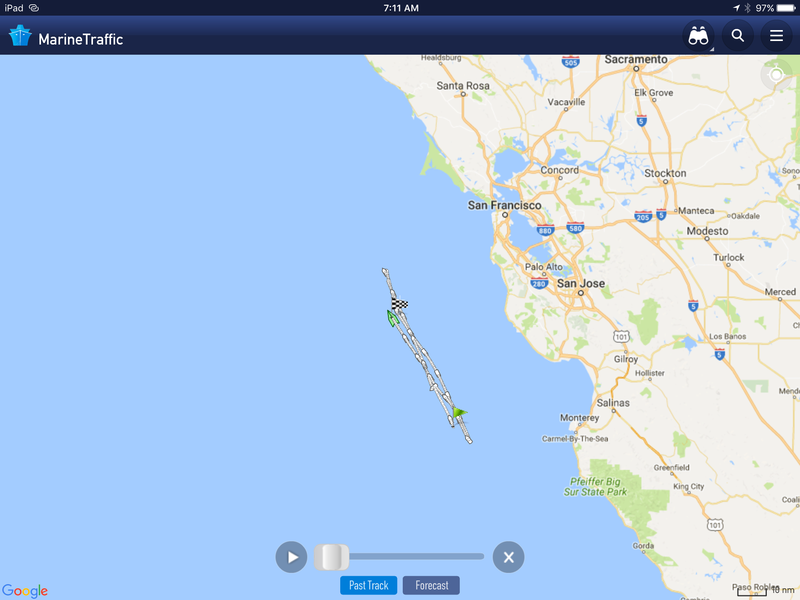 I guess all the dock space was full so she just circled off the San Francisco coast waiting on an improvement in weather. The next day we check AIS again and the Clipper Nassau is now making a northerly progression once again. The seas are still 10 ft. but they do appear to be dropping. All we can do now is wait on her arrival and hope none of the boats have any damage. It will be good to be reunited with Idyll Time. This entry was posted on May 26, 2017 at 10:10 pm. You can follow any responses to this entry through the RSS 2.0 feed. You can leave a response, or trackback from your own site. 1 Response to "Into Canada"
Our Canadian neighbors came for drinks at our place bearing a platter of Nanaimo bars – did you ever have these? Yummy!